Anthony Tommasini's Ten: Bach (in the tondo at left), then l-r, Beethoven, Mozart, Schubert, Debussy, Stravinsky, Brahms, Verdi, Wager, Bartok. On the night of March 30, 1955 at the Pantages Theater in Hollywood, film composer Dimitri Tiomkin made one of the more memorable and unintentionally hilarious Oscar acceptance speeches of all time. Tiomkin, a Russian Jew born in the Ukraine in 1894 and a student of the great composer Alexander Glazunov, was one of the most sought after film composers in Hollywood. A few years before, he had been the first composer to win two Oscars the same year—for the song and score of Fred Zinneman’s High Noon. Tiomkin had created a musical voice more distinctly American than any other of his other émigré colleagues. His command of English, however, was considerably less than colloquial. He likely would have continued with this litany, except the laughter so drowned him out that host Bob Hope had to intervene. Hearing the names of so many classical music giants called out during such a poplar culture celebration must have seemed wildly discordant. Tiomkin, however, was serious. Over the course of his Hollywood career Tiomkin amassed nearly two-dozen Academy Award nominations, four of them becoming Oscars. He knew whence his best ideas flowed and he wanted simply to say so to the world at large. Today, many of our films are crammed full of pop music songs, nostalgic as well as original, with tie-ins to CDs and downloads as their own raison d’être—irrespective of the dramatic needs of the film. But film music in the Golden studio era (and for some composers today) looked over its shoulder at the giants, mining the classics for themes, sometimes employing barely reworked rip-offs. Others, such as Korngold, incorporated themes from their film scores into their "serious" music. I was thinking of this “homage” to the classical masters after reading an article in the Sunday NY Times Arts and Leisure of Jan.21 by music critic Anthony Tommasini. Tommasini explains a process he had initiated shortly after the start of the year, a time when there is much list making by critics in all media for “best of the year” choices. Pop music, theater, TV shows, movies all seem to be fodder for this annual ritual. Tommasini further explains that many critics and institutions will at some point also issue a “greatest of all time” list, even enshrined in a Hall of Fame museum meant to draw thousands of tourists. The Chosen and the Not. As I see it, the critic’s job description does not include compiling lists of greats in order of greatness. What I do is champion, demystify and describe the composers, works and artists I admire, and, as appropriate, puncture inflated reputations. He was writing a paper on why people have different musical tastes, and he wanted to interview me. His questions were so thoughtful that I met him at a cafe. Mohammed picked my brain about how my tastes had been formed, about what I looked for in good music. Inevitably we came to the question of how it gets decided that certain music, certain composers are the best. And of course some really are. I’m open-minded but not a radical relativist. So if you were to try to compile a list of the 10 greatest composers in history, how would you go about it? For me, the resulting list would not be the point. But the process of coming up with such a list might be clarifying and instructive, as well as exasperating and fun. What happened next is that this august music critic decided to explore, in a series of blog postings, with suggestions and votes from readers, along with a series of five videos with him discussing composers and their music—to determine if it were in fact possible to make a list of the ten greatest composers of the Western Canon. J.S. Bach seemed the inevitable shoo-in at number one—and Bach became the jumping off point for his analysis. Beyond Bach, and maybe Beethoven and Mozart, this kind of value exploration seemed fraught with pitfalls—the passions of classical music listeners can run every bit as high as those of rock fans debating the relative merits of Eric Clapton, Joe Satriani, Ry Cooder or Jimi Hendrix in the guitar pantheon. But then an odd thing happened, and it is a discovery I want to take you on as well. I searched the videos that Tommasini cites in his articles. It turns out they are not just music videos of a critic making his case poring over scores. They are short films of Tommasini actually playing the piano; it appears to be one in his apartment. He is dressed casually in a deep blue, long-sleeved shirt, rolled slightly above his wrists. There are a couple of video cameras recording him playing and speaking, one of which is focused mainly on his hands. Tommasini is a decently competent player, but no one will confuse him with Horowitz or Rubenstein. The videos vary in length from 5 to 7 minutes, the first one (on Bach) being easily the longest. It was while watching this video that I got the urge to write this blog piece. The NY Times articles, while interesting of themselves, seemed hardly dense enough to ask readers to come along with me on this venture. Many of us perceive critics in the arts to have a diminished real-life understanding and experience of what it is they write about. The hoary cliché suggests that if they could actually do what it is they write about, they would—do: that the position of a critic is somehow nothing more than an artist manqué. I probably am guilty of this perception as well, and in many cases I think a damning dismissal of critics by artists is justified. How often do we sneer at some critic’s off the track musing about a film we have worked on? Not because the critic is not an insider—but because it is clear that the critic is simply ignorant of the techniques of the art form that he presumes to interpret. What is so compelling about Tommasini’s journey through his five videos is his clarity, his direct and immediate insight into the structure of the music at hand and why it is so damned important. He compels you to listen closely because what he is talking about as he plays is so subtle and intricate. These mini-lessons are not well served by multi-tasking at the computer. You need to hunker down and listen to the music and his commentary that flows in and around it. Tommasini’s absolute love for the music is transporting. In the first video, Tommasini lays out the genesis of his The Top Ten Composers list with a look at several pieces of Bach, including the Prelude in E major and the chorale Es Ist Genug. The surprise comes when he leaps across two centuries of music history and demonstrates how 12-tone composer Alban Berg (a pupil of Schönberg) used the Bach chorale in his own violin concerto, a haunting piece he had composed in the memory of the 18-year-old deceased daughter of a close friend. In the second video Tommasini begins to look at the phenomenon of the four stellar composers who made Vienna their home between 1750 and 1825: Josef Haydn, W.A. Mozart, Ludwig van Beethoven, Franz Schubert. At no other time and in no other place has there been such a concentration of musical genius. Tommasini challenges the traditional notion of an always upbeat “Papa Haydn” by playing the melancholy Variations in F Minor. He follows it with the Mozart Rondo from the Sonata in D major, K 331, making a case that Mozart even in this piece for solo piano was constructing essentially an operatic dialogue between the two lovers of The Marriage of Figaro. Mozart was surely one of the most gifted opera composers of all time; it is a compelling thesis to put forth: that Mozart’s contrasting divine melodies in many of his instrumental works are essentially voice dramas without words. The third video juxtaposes works of the titanic Beethoven—the man who early in his career shredded the dedication page of his Eroica (Heroic) Symphony when he discovered Napoleon had himself crowned Emperor of France—alongside the gentle, even timid, Franz Schubert, dead at 31, a man whose voice in over 700 art songs embodied the lyricism of the early Romantic era. Ludwig van Beethoven, pencil drawing by Friedrich August von Kloeber. “Franz Schubert am Klavier,” painting by Gustav Klimt, destroyed in WWII fire-bombing. Tommasini plays from the Schubert Piano Sonata in A minor, opus 143. He notes how much of Schubert’s music embraces melancholy, and that the tonal shifts from minor to major can seem even more melancholy. Next, he moves to Beethoven’s opus 126 #1 Bagatelle from the six that Beethoven composed between his mammoth Ninth Symphony and the late string quartets—he illustrates how a persistent hammered D note is emblematic of Beethoven’s sometimes obsessive rhythm, then concludes with a lovely footnote: Schubert was buried only three graves from his idol Beethoven in the village cemetery of Währing (later moved to Vienna’s Zentral Friedhof). Signed photo of the mature Johannes Brahms. But Brahms greatest genius was in his piano music, not just for solo piano like Schumann and Chopin, but in the way his chamber music with piano—trios, quartets, a quintet—equaled the ambitious reach of the full symphony orchestra. Here is a video of Julius Katchen playing the brief scherzo movement of Brahms’ Second Piano Sonata. All 20th century composers have had to come to terms with the tonal revolution of Claude Debussy. There is no other figure in French music that can stand head to head with the greatest of the Germans. I know it may sound prejudicial but, other than Hector Berlioz, even a Francophile like me is hard put to make a case otherwise. But there is Debussy, sandwiched between the First Viennese School of Haydyn, Mozart, Beethoven and Schubert, and the so-called Second Viennese School of Arnold Schönberg, Anton Webern and Alban Berg. I have never quite understood this primacy of Debussy for many critics, but Tommasini makes a compelling case for Debussy’s thematic stasis, tonal ambiguity and dramatic tension as heralds for the 20th century. Photo of Claude Debussy at the piano: fellow composer Ernest Chausson as page-turner. After an exploration of a lesser known but haunting piano prelude, he invites you into the lyrical labyrinth of one of the great melodies of all time, the Clair de Lune. The two pillars supporting the truss of 19th century opera are Giuseppe Verdi and Richard Wagner. Both men reflected the currents of nationalism in their early work; their late work embodied, in the case of Verdi, a glowing humanism, and in the case of Wagner, Teutonic transcendent mysticism. Without their contributions it is difficult to even conceive how impoverished the standard opera repertoire of today would be. Wagner is regarded as the genius of the leitmotiv, a melodic figure assigned to a specific character or object and then developed through the opera, but Tommasini illustrates how Verdi, especially in his later operas such as Otello and Falstaff adapted the technique to his own needs. If you’ve been keeping count so far, Tommasini’s musical journey has encountered 7 of the 10 “greatest” composers. Alas, Igor Stravinsky and Bela Bartok are not included in the video series, though they are both richly discussed in the NY Times articles. Signed, dedicated photo of Igor Stravinsky. Signed photo of Bela Bartok. Bartok was one of the great pianists of the 20th century and he lived into the age of pretty decent recordings. You can find YouTube examples of him playing solo piano. But the fiery opening of his second concerto for piano and orchestra is a great example of the keyboard virtuosity that had many of his contemporaries quivering in fear at its difficulty. Bartok, Stravinsky and Debussy were all brilliant masters of orchestral color. One can only imagine what radical sounds they would have created had they turned, as did Shostakovich, (sadly not included in Tommasini’s deca-pantheon), to composing for movies. I realize that this has been a skip and a jump, an elemental look at ten of the towering figures of Western music; I hope you forgive me for such a gloss. But sometimes, it is interesting to stop and look back at just what it is, on a basic level that makes this music and these particular figures so enduring. It is a gift to see it expressed through the words and fingers of such an astute and passionate critic as Tommasini. It makes me envious. Can you imagine the level of insightful criticism we would have today if even a small number of our film critics had the hands-on knowledge of their art form, as does Tommasini? One can dream. N.B. After I had written this piece, a friend in NYC sent me a link to an update that Tommasini posted on the NY Times music blog. 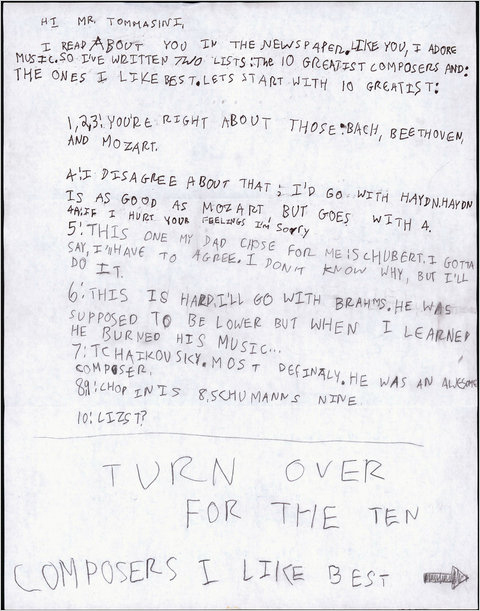 It was a handwritten letter he had received from an eight year old classical music lover who both agreed and disagreed with the esteemed critic's rankings. 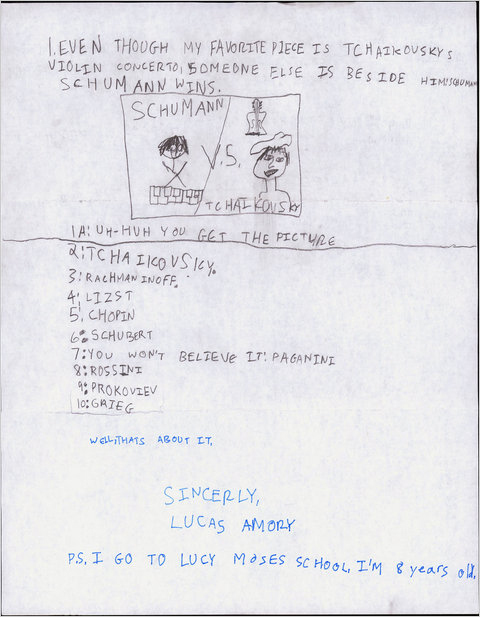 Tommasini posted the letter, front and back. Ah, there is music for kids beyond Bieber. Next week: "The Ruins of Detroit," a photo-essay by two young French photographers, and Eminem cruising Detroit's mean streets in a (say what?) Chrysler.